Just standing in the Presidio, looking out at the Bay, is a San Francisco treat. The Golden Gate Bridge is right there, in its red splendor. Crissy Field is down below, a marvelous expanse of landscaping right along the shore line. If you listen carefully, you can hear the fog horns blowing. Then you turn around, and here’s the Presidio itself, with its trees, its museums and its Civil War memorials. It’s a crazy good place for a teambuilding scavenger hunt that never feels over-crowded. Event Description: Formerly a military base (with the best view in the world), the Presidio is a fantastic, safe place in the City to do a corporate team-building event. Location History: The Presidio has a rich history spanning back to the time of the native Ohlone people. The Spanish arrived in 1776 to establish the northernmost outpost of their empire in western North America. The Presidio fell under Mexican rule for 24 years before the U.S. Army took control in 1846. Over 148 years, the U.S. Army transformed the Presidio grounds from mostly windswept dunes and scrub to a verdant, preeminent military post. Since 1994, the Presidio has been a part of the Golden Gate National Recreation Area. 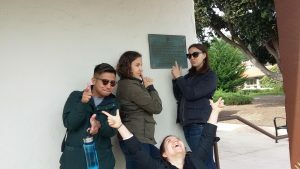 During your teambuilding treasure hunt… expect to encounter a legendary cannon; a row of buildings from the Civil War era; the glittering, new Walt Disney museum; a monument to Korean veterans; a giant bell and so much more.